In 1912 King George and Queen Mary came to Cardiff on the 21st June, 1921 to lay the foundation stone of the National Museum of Wales at Cathays Park. Following this event they toured the valleys calling at Aberdare, where Queen Mary called for Tea at a cottage off Victoria Square – this is commemorated by a plaque over the door, and then travelled to Hirwaun. Their route took them through Llwydcoed and past the Croes Bychan Inn where the stream marks the boundary between Glamorgan and Breconshire. There they were welcomed by local dignitaries, the local hunt and many local people. 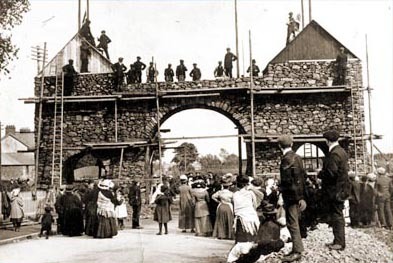 The miners at Hirwaun had erected two huge coal arches to welcome them, one at the top of Brecon Road looking towards Aberdare and one alongside the old vicarage at the top of High Street. Shops and houses in many village streets were decorated with welcome signs. 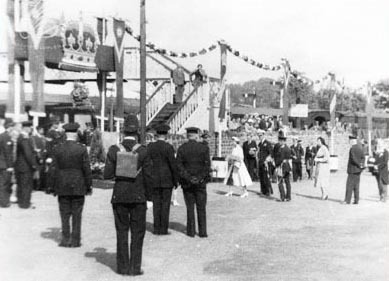 The King and Queen went again to Cathays Park, Cardiff on the 21st April, 1927 for the opening ceremony of the National Museum of Wales. 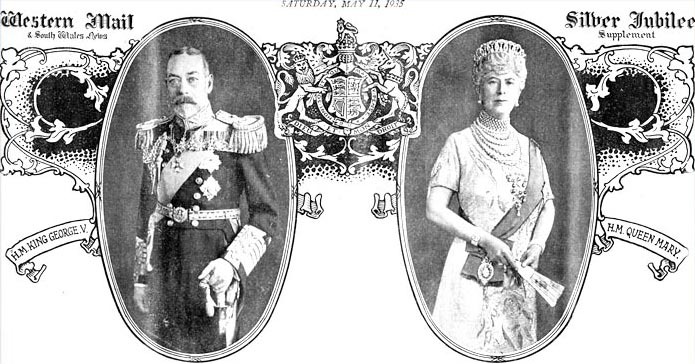 The pictures of the King and Queen were taken from a the Western Mail and South Wales News’ newspaper dated 11th May, 1935 – the edition was a tribute to the King and Queen on the occasion of their Silver Jubilee. Following her Coronation on 2nd June1953 , The Queen and Prince Phillip while making their country wide tour, travelled up from Cardiff seven days later on 9th June, through the Aberdare valley to meet the royal train at Hirwaun, which took them on to Swansea to continue their journey. That day the village was crowded with well-wishers and every vantage point was full of cheering people. It was a very happy day. 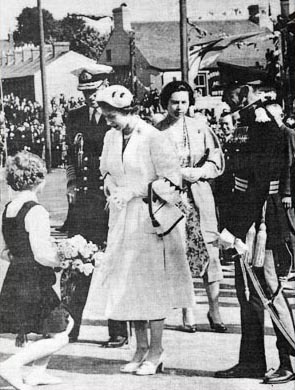 At the station, which was highly decorated, local dignitaries were presented to the Royal couple and a bouquet was presented to the Queen by a local school girl, Miss Gloria Green of Station Road, Hirwaun. The Queen accompanied by the Duke of Edinburgh and a lady in waiting outside Hirwaun railway station on the 9th July 1953 where the royal train waited to take them on to the next stage of the Royal Tour after the Coronation. In the presence of the Lord Lieutenant of Breconshire, Major General G. T. Raikes, C.B., D.S.O., Miss Gloria Green presented Her Majesty with a bouquet of two dozen pink roses. 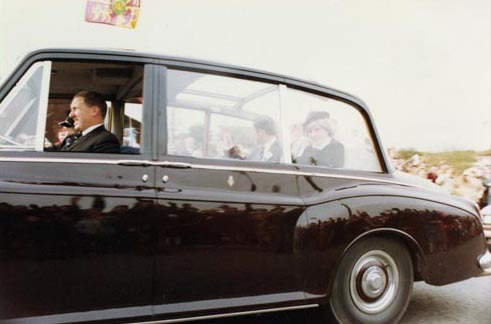 In 1981 Prince Charles and his bride, Lady Diana Spencer also made a tour of Wales and came through the village to the delight of local residents.